This product includes a short PowerPoint Presentation that addresses Energy. 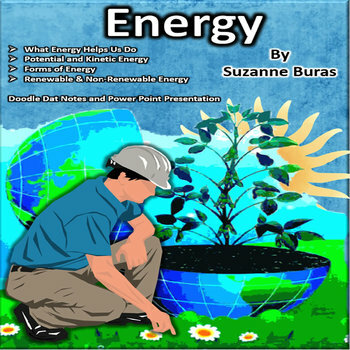 It includes a discussion of the Forms of Energy, Potential and Kinetic Energy, and Renewable and Non-Renewable Sources of Energy. Also included are corresponding two-page "Doodle Dat Notes" Pages. What a fun way to have students take notes as you study and discuss the topic using the PowerPoint Presentation. The "Doodle Dat" pages help students understand and record important information that can later be put in their science notebooks. In addition to information, the "Doodle Dat" pages include graphics that students can color in to make the pages their very own. Also, the visual aspect and process are a method that helps students remember the information. Lots of fun! An Answer Key is included! The resources are designed to enrich or supplement your current curriculum.